Le don à Maroc Humanitaire Team Aventure ouvre droit à une réduction fiscale car il remplit les conditions générales prévues aux articles 200 et 238 bis du code général des impôts. Organisme : L’ensemble des versements à Maroc Humanitaire Team Aventure permet de bénéficier d’une réduction d’impôt sur les sociétés de 60% du montant de ces versements, pris dans la limite de 5 / 1000 du C.A. H.T. de l’entreprise. Au-delà de 5 / 1000 ou en cas d’exercice déficitaire, l’excédent est reportable. Morocco Humanitarian Team Aventure (Maroc Humanitaire Team Aventure MHTA) is an organization/association created in 2016. Its creators (including the president Emmanuel Guet) have participated in this type of raid since 2013 (Super5 Raid in particular) and enjoy a good experience in the organization of this kind of events. From this experience, MHTA raid has been awarded the Super5 relay and its first edition will take place from April 19 to May 03. 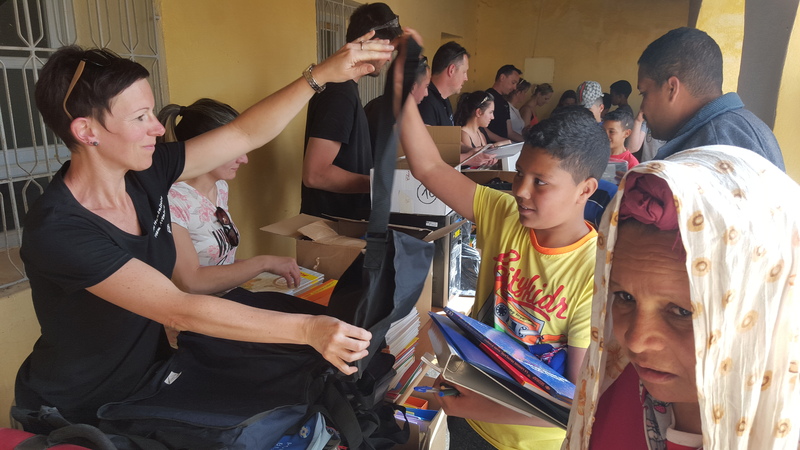 MHTA's main goal is to distribute medical equipment, clothes and school materials to populations living in need and/or extreme conditions, due to climate for example. Every year, MHTA organizes a party to raise funds (Moroccan party in St Jean d'Assé France in 2017, about 350 people). Then, all the material collected is redistributed in Moroccan schools, health centers or straight to inhabitants. Help Moroccan people !!! Help us !!! Drivers of this raid crisscross Morocco for about ten days from North to South then back in North again. Of course, this raid is not a race, the only purpose is to meet people and distribute material. In 2019, the raid will bring together a dozen crews . For all crew members, this raid is a great opportunity to express solidarity with populations whose primary needs are not always fulfilled. It is also an incredible adventure in a country that has a rich culture, traditions and somptuous landscapes. What will your donations be used to ? As you may know, donations are tax deductible in certain countries (66% in France for example), the website provides a donation certificate for this purpose. No hesitation, be generous !!! Back from the raid, each donor will be sent a mini-book of the raid by e-mail. You will be able to appreciate the use of your donatin and the benefit that ensued.